Colorful flowers, grass, ponds, fountains, parks – you can’t miss the fresh and green surroundings when exploring the stunning city of Amsterdam. 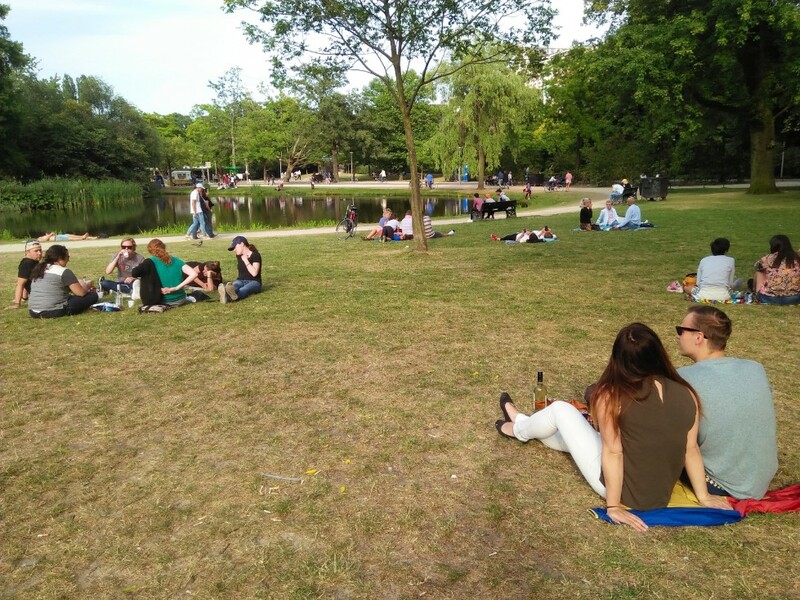 When the sun is shining, many of the green parks attract locals, tourists, couples, friends and families. The city has around 30 parks and those are bases for all kinds of activities and attractions: food & music festivals, BBQs, art, picnics and whatever you decide to do there yourself. I visited a few of the parks myself and here are some of my experiences! Vondelpark is probably the most popular park in Amsterdam and known all around the Netherlands. I really like how pretty the park is, and its central location. Throughout the summer the park is filled with people, music and art. 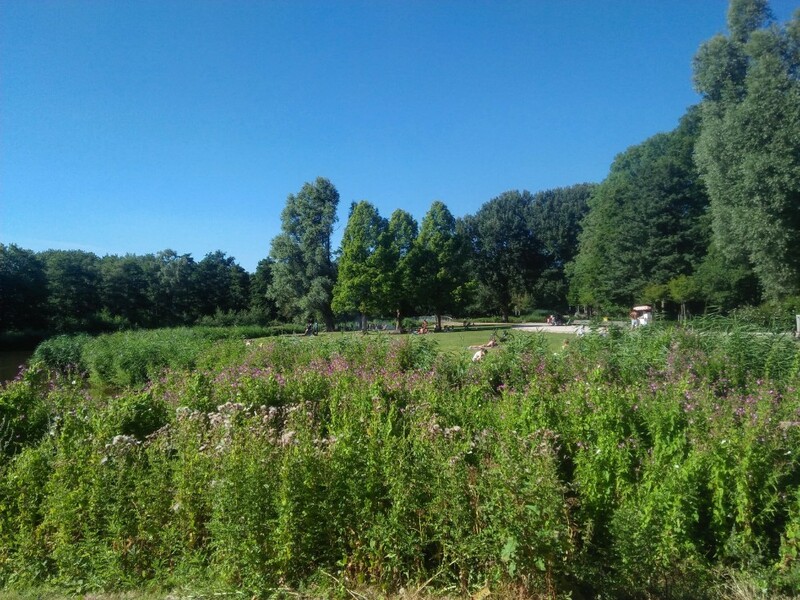 When you cycle through you will notice that the park has a lot of green areas, ponds, cafes, restaurants and creative sculptures – lot of things to see and experience! What I found really interesting was that Vondelpark has open-air theatre every weekend during the summer, where it is possible to enjoy free concerts. I was there on a sunny Sunday afternoon and they had live Dutch music on stage, surrounded by a bunch of little stalls selling refreshments and snacks. Vondelpark is definitely big enough for everyone to find something to do! Rembrandtpark, named by the famous painter in the Netherlands, is a calm green oasis in the Old-West of Amsterdam. Even though this park is just around the corner from Vondelpark, it is noticeably way less hectic. Rembrandtpark is the first park I visited in Amsterdam and I immediately liked the easygoing atmosphere. It was filled with people getting together with their BBQ and picnic blankets, people carrying their own chairs to the park to read a book in, people walking dogs or just laying in the grass tanning. It is a perfect place for a chilled afternoon on a sunny day. This park actually translates to Amsterdam Forest. When you cycle through it, it actually seems like a small national park. The sandy and quiet forest routes surrounded by leafy trees creates a nice contrast to the hectic city life in Amsterdam. I did a little tour around the forest (there are so many routes you can take! ), discovering cool spots and activities there: a cool piece of grass maze, possibility to kayak on the small rivers of the forest, zip-lines, stand-up paddling a goat farm, rowing and plenty of swimming possibilities! You can experience some culture in the park too! When I was visiting the forest-theatre had a play for kids but throughout the summer they have a lot of well-known concerts there and the venue couldn’t be better. If you want to be a bit closer to nature, this is 100% the right place to visit. From Teleport, Westerpark is not only a gateway to the center of Amsterdam. It is also a great place to spend an afternoon! 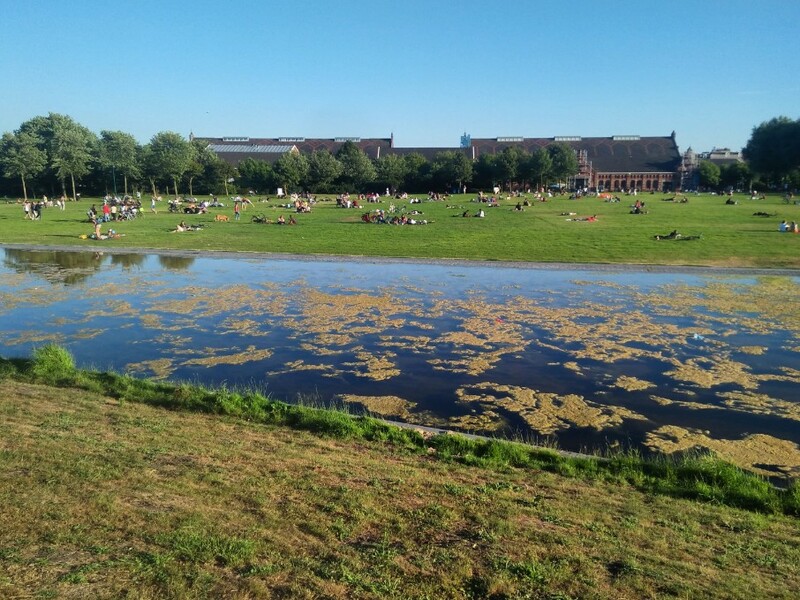 A great tanning spot that I found when cycling through the park was this big grass area by a long narrow pond – people barbequing, listening to music and just enjoying the sunny day in Westerpark. There are also interesting art pieces in Westerpark, like for example a headless woman floating on a little pond in the middle of the park – definitely not something you find in every place. Westergasfabriek (that was added later to the park to remodel it) gives an urban and cultural touch to the park, and also hosts events. You can also enjoy a drink in the Troost Brewery or eat a seafood lunch in Mossel & Gin. 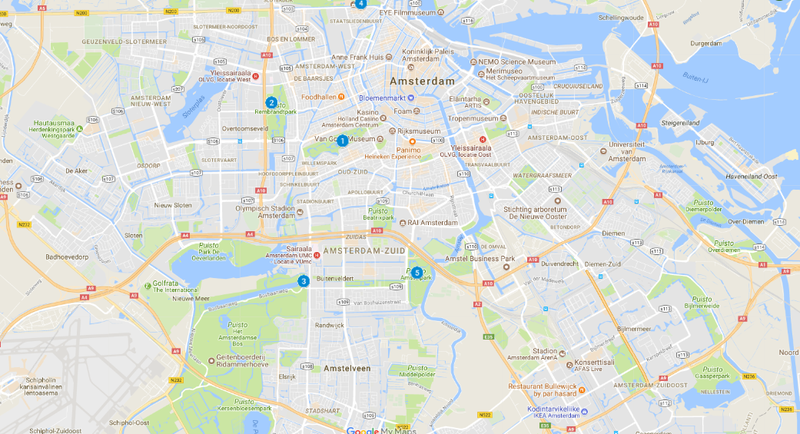 This park is one of the rare places in Amsterdam – no bicycles allowed! When you enter the park, you are obligated to leave your bike outside. The atmosphere in Amstelpark feels calm and relaxed when you take all the bicycles out of the picture. 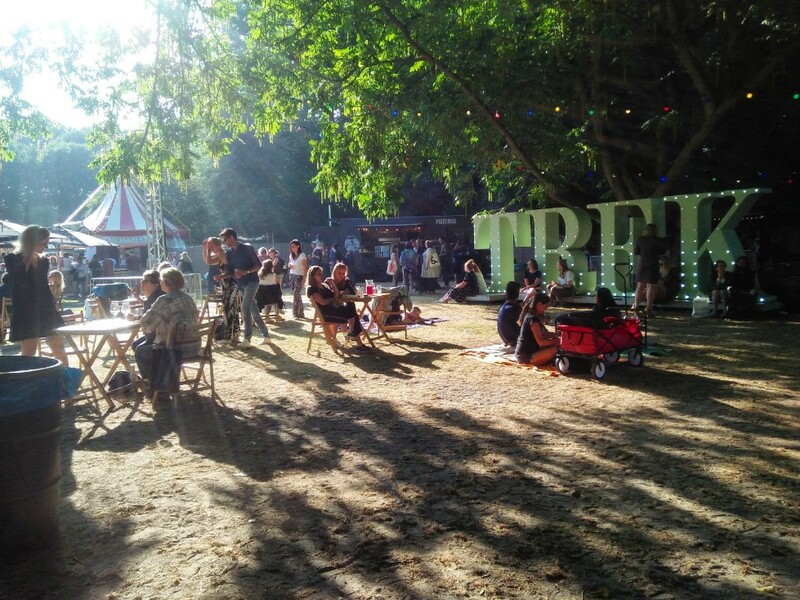 Amstelpark is also a great venue for festivals. I visited the food truck festival TREK, which was amazing (especially because you didn’t have to be aware of bicycles) and it was a great fit for the parks atmosphere. They had tasty street food from all over the world, music, a fantastic view, and lots of people to enjoy it! 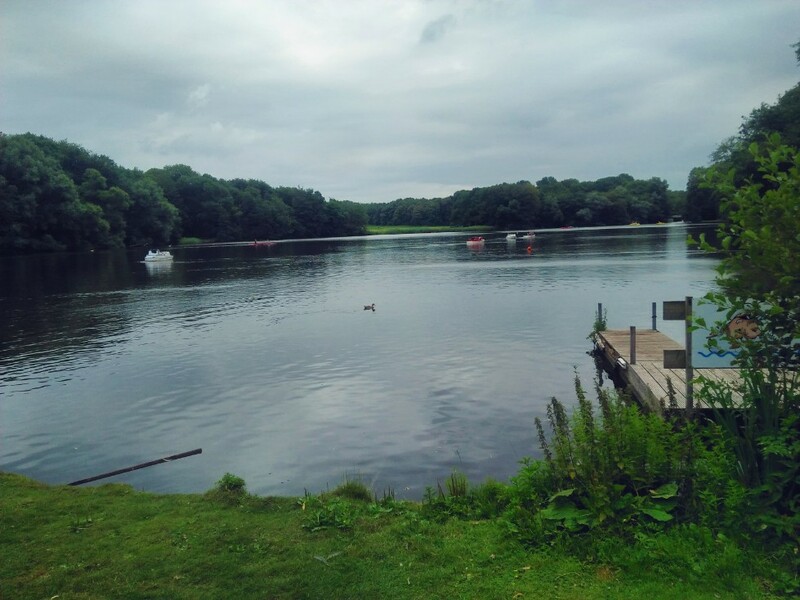 What makes Amstelpark even more special is that you can see kangaroos there! All of the parks were really nice places for tanning and picnics, but still all of them had something unique – animals, kayaking, concerts, calm atmosphere and urban elements. Another good reason to visit a park in Amsterdam is that there is never a cost to enjoy the fresh surroundings! With this map you can navigate your way to the green gems in the city!